Happy 200th Birthday, Henry David Thoreau! In your honor, we’ve added a new text to The Readers’ Thoreau, Digital Thoreau’s platform for reading Thoreau socially. The text is “Walking,” one of Thoreau’s most popular essays, published in 1862. On April 23, 1851, Thoreau “tried out a new lecture, entitled ‘The Wild,’ on the Concord Lyceum and on May 31 repeated it in Worcester. It was to become one of his favorite lectures, one that he repeated many times, working it over and adding to it each time until eventually it became large enough to break into two, the new part entitled “Walking.” Because he knew the market for it would vanish once it reached print, he was careful not to have either part published in his lifetime. But just before his death, he put the two back together again and sold the essay to the Atlantic Monthly where it was published in the issue of June 1862 . . .” (Walter Harding, The Days of Henry Thoreau, Princeton: Princeton University Press, 1962: 286). Start reading “Walking” now or register an account on the main site and join the public group “General Discussion” to start a conversation in the margin. The Thoreau Society is trying something new for its 2016 Annual Gathering, the 75th since the society was founded by a small group of Thoreauvians led by Walter Harding in 1941. The Society is asking all presenters to consider putting the text of their presentations on Digital Thoreau’s community site for reading Thoreau socially, The Readers’ Thoreau. Readers interested in Thoreau and his times will be able to follow the Annual Gathering’s proceedings online, and Readers’ Thoreau members (membership is free!) will be able to comment on the presentations right in the margin, as they can already do with Walden and “Resistance to Civil Government” (aka “Civil Disobedience”). The aim is to enrich the conversation, both during and after the Gathering, about the intersection of Thoreau and nineteenth-century literature, history, science, and philosophy, while also giving the world at large a glimpse of the wide-ranging discussion that characterizes the yearly four-day convergence of Thoreauvians in Thoreau’s home town of Concord, MA. Readers’ Thoreau members (did I mention that membership is free?) will be able not only to comment directly on presenters’ texts but also to message one another directly through the site and exchange ideas in a dedicated discussion forum for the 2016 Gathering. 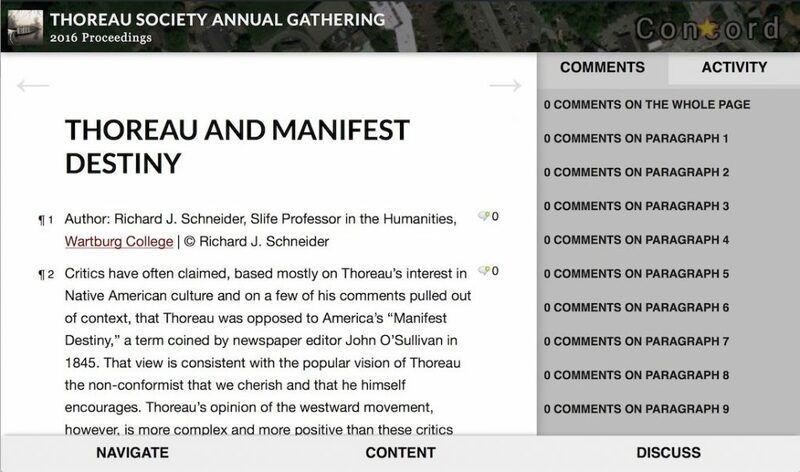 The design of The Readers’ Thoreau network will enable both presenters and commenters to link references to Walden and “Resistance” directly to passages in the network’s editions of these texts, and to add comments on the texts that link directly to the papers from the Gathering. Some authors have agreed to post copies of their papers even before the Gathering begins, which should make for livelier and more thoughtful face-to-face exchanges in their sessions; others have agreed to post after they’ve had a chance to share their ideas live. A couple of papers are already up on the site; we’re looking forward to adding more, and to making this kind of sharing and engagement an integral part of future Gatherings. This spring, about two dozen students in two sections at Duke Kunshan University in Kunshan, China are taking “Walden International: Analyzing Thoreau Across Cultures” from Patrick Morgan, a Ph.D. candidate and Graduate Instructor in English at Duke University and a graduate of SUNY Geneseo (English, Geological Sciences, 2010). Morgan’s Kunshan students are discussing Walden in the margins of Thoreau’s work at The Readers’ Thoreau, the online community of Digital Thoreau. In addition to meeting with Morgan for 300 minutes each week in class and exchanging ideas online in the margins of Walden, the Kunshan University students are taking a digital field trip to Walden Pond thanks to a website Morgan has created that links passages of Thoreau’s text to YouTube videos he made in which he reads aloud from Walden while capturing the pond’s sights and sounds. Morgan has been active in Thoreau studies since his undergraduate days at Geneseo, where he presented on “Thoreau’s Bedrock: Emerson’s Influence and the Geomorphological Significance of Emerson’s Cliff, Concord, Massachusetts” for Geneseo’s day celebrating undergraduate research, GREAT Day, in 2010. That same year, his article on “Aesthetic Inflections: Thoreau, Gender, and Geology” appeared in the Thoreau Society’s scholarly annual, The Concord Saunterer. In 2015, Morgan participated in an NEH summer institute for college instructors on “Transcendentalism and Reform in the Age of Emerson, Thoreau, and Fuller” conducted in Concord by a roster of scholars that included Sandra Harbert Petrulionis, Phyllis Cole, Jayne Gordon, Robert Gross, John Matteson, Wesley T. Mott, and former Geneseo Harding lecturers Laura Dassow Walls, Megan Marshall, and Joel Myerson. In addition to his studies and teaching at Duke University, Morgan serves as an editorial assistant at the scholarly journal American Literature, published by Duke University Press.